Secret documents published by Wikileaks reveal that the Syriac Orthodox Patriarch Zakka Iwaz and his emissary accuse U.S. and Israel of being behind the September 11 attacks. With several misguided statements the leaders of the church are again taking the party of regimes and rulers who have oppressed the Assyrians in the Middle East, writes freelance journalist Dikran Ego. Syriac Orthodox Church has for the past 150 years been dominated by church leaders who have often put their own personal interests before the people. Many times, these churchmen had run the enemy’s errands and praised persons who have committed brutal mass murder and acts against the Assyrians. Even today, the leaders of the church are seen as the representatives of the Assyrian people and figures in various contexts that influence the fate of the Assyrians in critical issues. These church leaders have historically proven to be damaging the Assyrians and compromised the Assyrian peoples’ existence and national rights in their countries of origin. Patriarch Elias Shaker III is a good example of a church leader who has shown boundless loyalty to a regime that committed genocide against his own people. After Seyfo, in 1918, the English Major EW Charles Noel comes to Mardin to ask the representatives of different Assyrian groups’ to join England’s rule. When representatives of the different groups do not agree the question is sent to the Patriarch Elias Shaker for a final decision. Shaker ends the discussions with the following response to Major Noel: We are the Turks. We do not want any other rule than the Turkish. Otherwise, we are prepared to fight as one body, and offer both our soul as our property. Patriarch Elias Shaker chose therefore the Turkish rule which committed genocide against the Assyrians instead of English rule. The event is documented in Bishop Yuhanon Dolabanis book ”Tarihte Mardin” on page 102. Top secret ancient documents now published shows that Elias Shaker loyalty to Turkey was a paid job. He allowed himself to simply be bought by the then rulers to deny Seyfo and sell the national rights of Assyrian people. We salute our Sultan. A lover of justice. Let the Sultan Abdul-Hamid’s empire spread among the nations. We pay tribute to His kingdom with lofty praise. Sir, give him power! Yes, a godlike power. Let His enemies and envious men in shame be trampled under his feet. Sultan Abdul-Hamid II is better known as ”Kizil Sultan” which means ”the Red Sultan.” He received this title after having ordered the mass murder of more than 300,000 Christian Armenians, Assyrians and Greeks in 1895. Although this brutal mass murder of Christians the Syriac Orthodox bishop Fawlus in Constantinople chooses to praise the mass murderer. 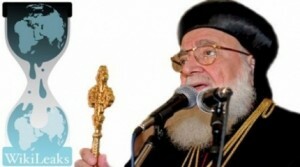 If even he, like Bishop Patriarch Elisha Shaker allowed himself to be bought, we do not know today. It may come up when the old documents will be examined by historians. Almost 100 years later the story is repeated. This time it is Patriarch Zakka Iwaz who’s in the center of the events. With several misguided statements the leaders of the church are again taking party of regimes and rulers who have oppressed the Assyrians in the Middle East. Secret documents published by Wikileaks shows the Patriarch Zakka Iwaz and his emissary go to a harsh attack on the United States, accusing the United States and Israel of being behind the September 11 attacks and to then accuse Islamists for everything. During an international conference organized by the British Embassy in Syria in early June 2009, Patriarch Zakka Iwaz emissary went to a harsh attack, accusing the U.S. of using the fight against Islamic terrorism as an excuse to extend its hegemony in the region. Furthermore, the Patriarchs’ emissary says: U.S. has manipulated the September 11 events; the U.S. has chosen the language of violence instead of the language of diplomacy in its attempt to impose their hegemony and plunder the world’s resources. In the same conference there was also Syrian Grand Mufti Dr. Ahmad Badr Hassoun and other Muslim leaders. According to the embassy’s records, these Muslim leaders’ speeches were much more restrained and not even been around to criticize the U.S. or the West. One cannot help to wonder why the Patriarch Zakka Iwaz emissary goes almost to a rabid attack on the United States and the West when Muslim leaders in the same conference do not even mention the U.S. or the West? Why do our church leaders feel obliged to make a frontal attack? Do they feel compelled or are they doing it with free will? Some say that the leaders of the church are forced to stay on good terms with the ruling regimes in the Middle East. Failure to do so would harm the community. In other words you’re a hostage and subjected to these regimes discretion. But there are others who believe that leaders of the church often offer themselves to figure in these contexts. With zero leadership skills and with a religious conviction that is total absent these people want to claim themselves through similar outcomes as the Patriarch Zakka Iwaz emissary has made in the above-mentioned conference. When there were elections in Syria 27 May 2007, elected bishops Ablahad Shabo and Benjamin Atas transformed their respective churches in Södertälje to polling stations to vote YES to a new seven-year period with the Syrian dictator Bashar al-Assad’s oppressive regime. Why was it important for the bishops to turn their churches to polling stations for one of the world’s most closed dictatorships? Had they been forced or did they do it by free will? Returning to the Wikileaks document, where it appears that the British Embassy had difficulty accepting Patriarch Zakka Iwaz attack. This is how the embassy notes the Patriarch’s statement: The Assyrian Patriarch’s remarks are unacceptable, I will raise the matter with the Ministry. The secret WikiLeaks documents can be read here. During the international conference that brought together religious leaders, teachers, diplomats, politicians, and economic researchers from Britain, Egypt, Qatar and Syria, holds our Patriarch Zakka’s emissary a kamikaze speech that undermines Assyrian peoples’ existence in the Middle East and credibility in the West. Why should the West care about the Assyrians, when our church leaders have this attitude? The story is about to repeat itself, it is almost 100 years ago as Zakka Iwaz predecessor Elias Shaker III sold the Assyrians to the Turkish rulers. Now Zakka Iwaz donates the rest to Arab dictators. This disclosure has been done thanks to Gabriele Yonans research in the Wikileaks documents.